We’ve all read the advantages of repurposing compelling content and how you can take it further by creating a secondary piece of content and sharing it with a different audience. But besides taking a blog post and turning it into a Slideshare and promoting that, what else can we do as content marketers? 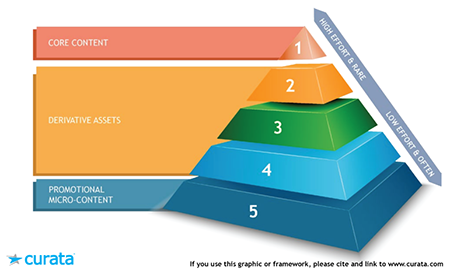 Although it didn’t take as long to construct as the original pyramids of Egypt, the Content Marketing Pyramid takes the idea and concepts of good content to an entirely different level. Pawan Deshpande, Founder and CEO of Curata and the team at Curata recently authored an article titled ‘The Content Marketing Pyramid: How to Generate More with Less’. It just so happens that article is actually a derivative piece of content for their recent eBook titled: ‘The Content Marketing Pyramid’. During the podcast Pawan explains exactly what the idea and concept is of the Content Marketing Pyramid, some advantages of using the pyramid approach and a couple methods of implementation. His is our featured article of the day and Pawan will also be speaking at Content Marketing World 2015, so grab a beverage of your choice and give a listen to this episode of your ‘A Slice A Day’.